This entertaining home haunt was a perennial in Studio City for many years. Sadly, it now resides in the Graveyard of Lost Halloween Haunts. 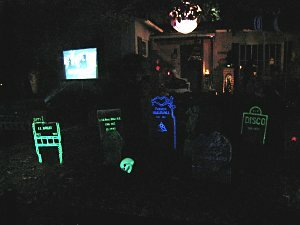 The self-proclaimed "epicenter of Halloween" featured spooky effects, tombstones, props, and a lair haunted by a friendly Witch. The haunt was an outdoor yard haunt with no maze, though trick-or-treaters did have to pass by boiling cauldrons and mechanical dragons to approach the Witch's Lair (a decorated garage). The tone was suitable for all ages, although children under eight were advised to be accompanied by a parent if they wanted to meet the Witch up close. The Witch's Castle would run on two nights every Halloween: October 30 was a preview with props and effects but no cast in costume; Halloween Night provided the full show, with the Witch in her lair, handing out candy and treats.